It's no secret customer service is all about producing positive experiences for customers at each touch point along the way. And for just about any large corporation, the call center is a key touch point. In fact, it's the central hub of inbound and outbound communications with customers. Across large businesses, the emphasis on the customer experience continues to increase. For example, in a 2017 survey by Deloitte &Touche, 88 percent of respondents cited customer experience/expectations as a main driver of growth within their contact centers, up from 71 percent in a 2015 edition of the same survey. While a well-managed, on-premise call center can also meet customer expectations, a cloud-based contact center generally allows a company to provide advanced capabilities to customers in a more cost-effective manner. Here are five key differences between a cloud and an on-premise call center. These days, most on-premise call centers are voice-centric, offering traditional features such as call transfers, on-hold wait music, and conferences. Customers today, however, want multichannel communications, offering them a choice between voice, SMS, chat and mobile web, for instance. Many businesses are trying to determine the best ways of meeting these kinds of customer demands. In a 2018 study by Aberdeen Group, businesses named the following as their top two call center challenges: "implementing new technologies and channels to address changing customer behavior" (36 percent) and "delivering seamless customer experiences across all channels" (32 percent). A modern cloud contact center expands on the capabilities of a traditional call center in many ways, including built-in multichannel communications management, with a seamless routing of customers between channels. But wait, there's more. Another 29 percent of respondents in the Aberdeen Group study cited increases in contact center operating costs as a major challenge, with multiple responses permitted. Operating an on-premise contact center requires upfront capital expenditures for everything from server hardware and headphones to software licenses. After a contact center is set up, it then requires hardware and software updates, which will likely be handled internally by an already busy IT department. 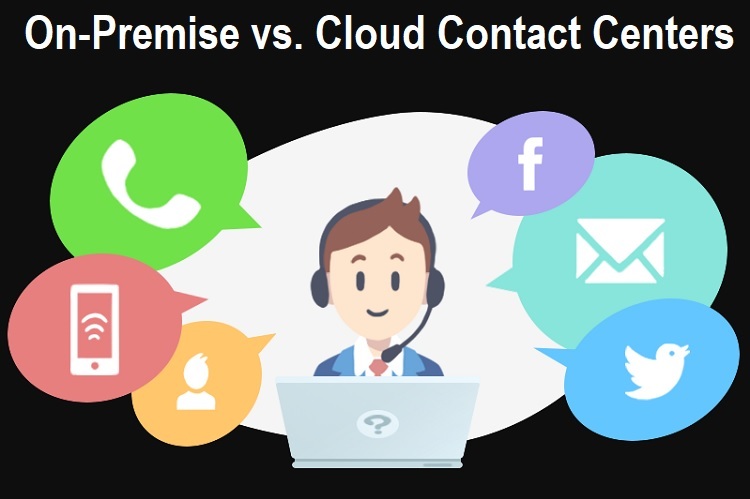 Moreover, updates to existing on-premise contact centers are unlikely to add the advanced features from which competitors might already be benefiting through the use of cloud call centers. In contrast, to set up a cloud contact center as a SaaS service, all you need to do is install a software app. Billing is performed on a monthly subscription basis and is easily manageable as an operating expense. An on-premise call center might have stable technology in place that helps to eliminate call lag, reduce the numbers of dropped calls, or improve call quality. That isn't necessarily the case, though. In contrast, modern cloud contact centers tend to differentiate themselves through dependable technology, often driven by highly reputable cloud services such as Amazon Web Services. If you use a cloud contact center on a SaaS basis, all you need is a strong Internet connection to benefit from the superior reliability. Unlike most on-premise call centers, modern cloud contact centers use IVR with built-in "smart" technology for preserving context across channels, predicting caller intent based on recent transactions, and adapting to each caller's experience level. When a customer calls in by voice, for example, the system might already be aware that they just booked a hotel room over the web or has already called twice about a product delivery issue. Other advanced features include in-queue callbacks, phone surveys, virtual receptionists and outbound notifications. Also in the Aberdeen study, 32 percent named "finding and retaining qualified customer support staff" as another top challenge. The automated nature of the modern cloud call center empowers employees by reducing the number of repetitive tasks they must handle, thereby decreasing boredom and potential burnout, and helping customer service reps advance in their careers by letting them focus on the most intricate customer interactions. The IVR system will automatically handle many calls in a self-service manner, providing the customer with quick information about order status or service outages. Only the more complex and sensitive calls are routed to a live agent. On-premise contact centers typically provide far fewer advanced capabilities than cloud call centers, while costing much more to set up, manage and upgrade. Plus, cloud call center features like multichannel communications and smart call routing can enhance the customer experience while also empowering employees. If your existing on-premise call center is due for an upgrade, consider moving it to the cloud instead.